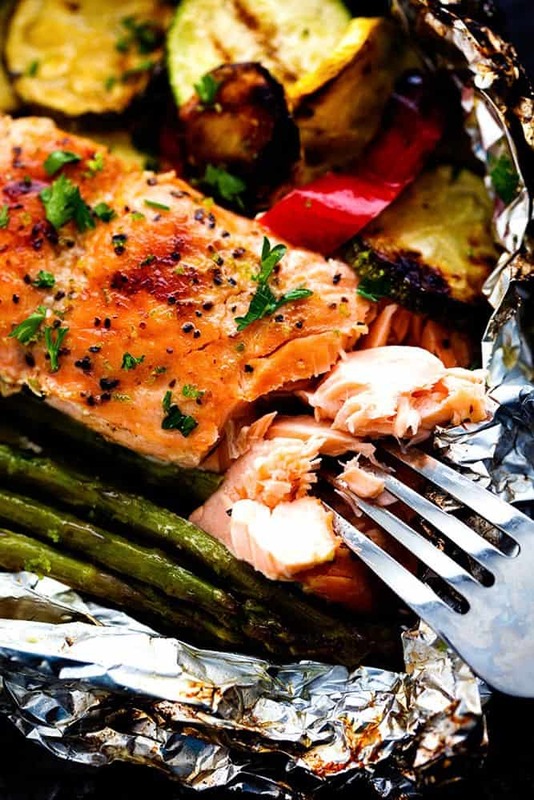 Lime Butter Salmon in Foil with Summer Veggies is grilled to tender and flaky perfection. The foil seals in the lime butter flavor and will be one of the BEST things that you eat! This right here?? is one of the best things that I have ever eaten. I am a huge lover of salmon. But salmon can be tricky when cooking on the grill. It can be delicate when placed directly on the grill. So cooking the salmon in foil was such a genius idea of mine. Foil dinners take me waaaaaaay back to when I was young. I would look forward to two things every summer. Foil dinners and s’mores. It was so fun going with my family on camp outs and cooking foil dinners over the camp fire. They just get so tender sealed up in foil over the fire and the char marks inside are the best. 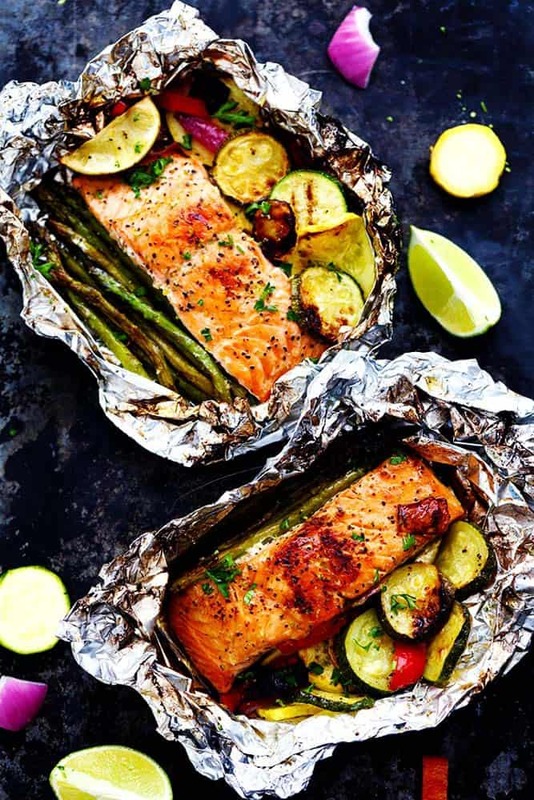 Every single time I would go camping I would always request to make foil dinners and had so much fun making them with my mom. Foil dinners aren’t just for camping though. 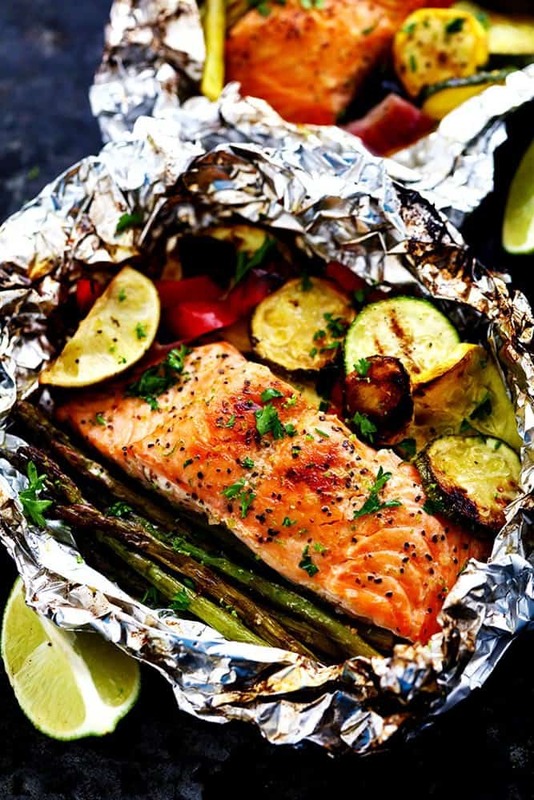 And today I bring to you the most amazing salmon in foil recipe. The salmon grills in a lime butter sauce. So simple and the flavor is out of this world. My favorite part about foil dinners is that it is easy clean up and a meal in one. The fresh summer veggies cook so tender in the lime butter sauce. I love that sizzle that you hear when you put it onto the grill. I just can’t get over the flavor of this salmon. I am all about light and fresh meals in the summer. Big heavy meals just don’t sound so good to me when it is so hot outside. So fresh salmon and summer veggies is right up my alley. The lime butter sauce cooked this salmon and the veggies to p-e-r-f-e-c-t-i-o-n.
You guys have to grill these up this summer!! You are going to love them!! Heat grill to medium heat. Cut 4 sheets, enough to wrap the salmon and veggies, of heavy duty foil. 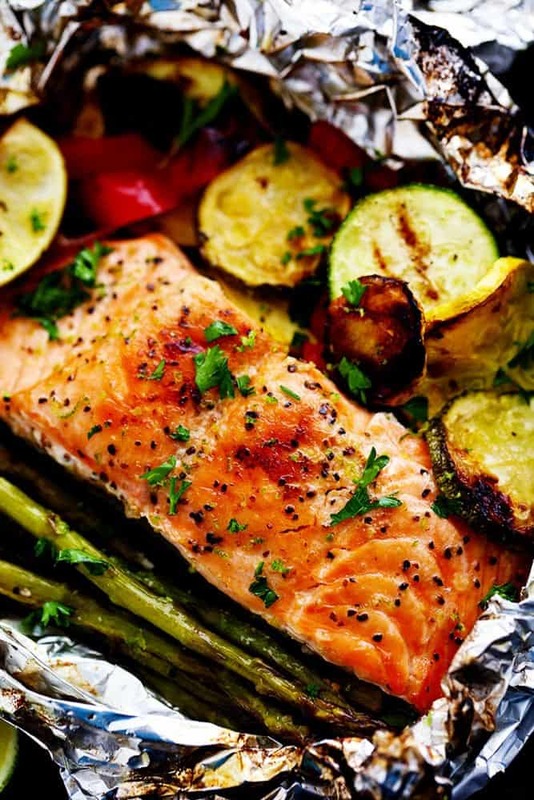 Place salmon on center of aluminum foil and divide the veggies into each packet. In a small bowl add melted butter, lime juice, and zest of lime and mix. Pour evenly into each packet. Add lime wedge in each packet and bring up 2 sides of foil over salmon so edges meet. Seal edges, making tight ½-inch fold; fold again, allowing space for heat circulation and expansion. Fold other sides to seal. Place salmon packets onto grill and grill for 13-15 minutes flipping at about 7 minutes.To serve carefully open packets and garnish with parsley. What a special childhood memory that inspires this recipe! I love how easy it is to create these foil dinners! The salmon and summer veggies look so delicious! And you can’t beat the easy clean-up! So much to love!! Goodness, I have been wanting more healthy salmon recipes. This looks PERFECT! Do you think this would work in the oven as well? Yes for sure! Bake it at 350 degrees for about 15-20 minutes. This looks absolutely delicious and I can’t wait to try it! If you were to fix it in your oven instead of grill what temperature and for how long would you bake it? I don’t have a grill. Would this work in the oven? What temperature would you suggest and for how long? Looks luscious. What about those of us without a grill. . .oven temp setting suggestion and timing? This looks delicious but I’m not a big seafood fan. Do you think this would work for chicken? You can definitely sub for chicken. Food tasted great, but the technique doesn’t really work for me. Does anyone’s really come out looking the same as the pictures? How do the veges get that grilled look? My salmon was pink and kind of white – not at all brown and grilled looking like the pictures….you didn’t cook anything prior to putting it in the foil? Also, you flip yours? Cause my juices seeped out when I tried that – any suggestions? Make sure the foil is sealed. And I didn’t cook anything prior. Some veggies got more of the charred look because they were closer to the flame. And yes you want to flip it about halfway. I like this recipe very much, so much in fact that I’ve shared a link to your post together with one of its photos, on my own blog today. I hope that’s okay with you. If you wish me to remove it, please let me know. Thanks. I followed the recipe to a “t” and it tasted great but it did not turn out like the picture. I was disappointed when I opened the foil and saw fish and veggies did not have the grilled look, if I was to make again I would not use foil and cook directly on grill. Drizzle lime butter after cooked.